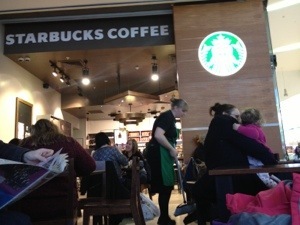 … is a new Starbucks in Derby! I’m writing this from Derby’s one and only, solitary, unique, isolated, orphaned, stand-alone and — above all — over-capacity ‘real’ Starbucks. Don’t get me wrong, Lara and her team do a great job, but they simply don’t have the tools (i.e. the right sized store) to cope with the demand for large periods of time. The recent refit has helped, but only a little. As I type, the queue is out the door and this is not peculiar to the Christmas period. How many potential customers see that and are immediately put off. It isn’t as though there aren’t enough Costa’s in close proximity for them to turn to instead. Similarly, the ‘licensed’ Starbucks at Pride Park has reinvented itself in the last twelve months. It has gone from a potential gold mine spoiled by indifferent staff to a real treasure of a place – the staff (the same people!) are now welcoming and evidently proud of the brand. There is nothing to be critical of in respect of Pride Park – except the perennial issue of licensee branches not being able to accept Starbucks Card and its Rewards. Returning to the issues with the Westfield Centre Starbucks. I realise that much of the problem is right there — Westfield. They are, I guess, for that reason that there is no BT Openzone free WiFi? This is something of a deal breaker for me, combined with being completely unable to get comfortable and work, sitting out in the mall as I am. I also get that, given the huge amount of footfall here, not making customers comfortable, and so having them settle for an extended period, is likely deliberate? This is an awful long way from “The Third Place” concept that Starbucks used to promote. I have said it before, and I will continue to wish for it, but can we PLEASE have East Street back!? It is still vacant and itself will benefit from the significant upturn of pedestrian traffic there now the bus station has reopened. In its glory days (i.e. right up to the moment it suddenly closed) it was everything I would expect of a Starbucks, having sampled the brand around the world. It was the epitome of the Third Place. I apologise for your recent experiences with your local stores in the area. We recently announced our intent to create 5,000 new jobs in the UK over the next five years. To support our jobs creation plan, our intention is to build 200 new drive-thrus across the country over the next five years. I appreciate your request for a Starbucks store in your area and have shared it with our Store Development Team for their consideration. Is it just me, or have they completely missed the point? I really wasn’t looking for an apology, but that is clearly the default position these days. The original text of the email was in different fonts, confirming the obvious that the reply was simply two stock answers pasted into the message. I suspect this is the subject of many an academic dissertation, as well as Reports to the Board in competing companies. What is it about Starbucks? Inevitably, I am sitting in a branch of said chain as I type this – Sheffield, as it happens. Although other than most of the customers around me being apparently students waiting for term to start at the nearby Hallam University, I’m not sure the location is too relevant. That said, what did strike me about this one is that there was no queue. 16:00 on a weekday on the periphery of Sheffield city centre, that is as odd as it is unusual. 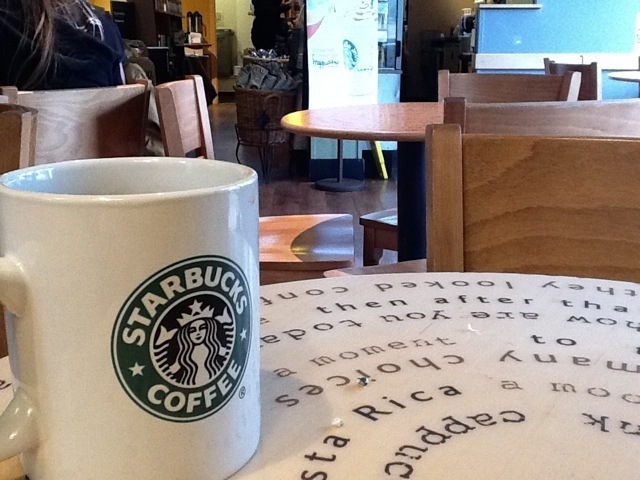 So, back to the Question: Why Starbucks and not, say, Costa or Nero? For me the immediate answer is that the other two insist on serving espresso based coffee only – Americano, if you will. SBs stand alone in serving drip-brewed coffee, which I much prefer… I find it has more taste. There has to be more than that though. There was a time SB branded themselves as “the third place”, meaning not home and not work. A place to meet, sit, relax and do whatever. The problem is, sitting, relaxing, whatevering doesn’t generate income per se. Sure, it equates to ‘footfall’, a crucial metric in retailing, but one coffee that lasts three hours bought by a customer who occupies a table (and uses electricity for their laptop) isn’t profitable… Especially when the next group of potential customers look in and decide the place is full, moving on instead. With a notable exception, which I will move onto in a moment, there are few outward sign of this apparent dilemma. Power sockets are still – sparsely – in evidence but the comfy settees seem to have largely disappeared in favour of more densely packed tables. They even stll do free refills on brewed coffee – ever an invitation to linger – although the availability of this perk is no longer advertised. The exception I alluded to is Derby. For a short but halcyon time we had five Starbucks in and around the city. The recession and Starbucks’ admitted belt-tightening in the mid-noughties whittled that down to one and a half. The half, by the way, is the franchise branch at Pride Park… Though for its many faults, that one is by far the most meeting/laptop friendly, for fairly obvious reasons. The “local” at Willington services disappeared virtually to the day of its first anniversary, due, no doubt to an introductory rental rate expiring and some failed brinksmanship by the company? A sad loss to me personally, but I have to grudgingly accept the economics involved. Less understandable, however, is what happened in the city centre. The original Derby SBs was on East Street. A deceptively small but cozy space located in a first class people watching area. Then the Eagle Centre transmogrified into the Westfield, with two clinical and souless SBs. Soon after, East Street bit the dust – Derby city centre clearly not being able to sustain three Starbucks within a quarter of a mile of each other. This isn’t Manhattan we’re talking about! As it turned out, the Westfield was unable to sustain two SBs and a year or so ago, the larger, and slightly more preferable one closed. The location now plays host to Ilkeston Co-op Travel! It was preferable in my mind because it was an enclosed unit. Though lacking a view of the wider world, it at least insulated you from that world for a while. The remaining outlet is barely more than a kiosk servicing an open seating area… and so is the exact opposite. Plenty of world passing by, just too open and windswept. My plea to Starbucks (which I have written to them about – receiving a polite brush-off in response) is to reopen East Street. The unit has remained empty ever since, and with the re-incarnated bus station, growing Riverlights complex, and temporary relocation of the City Council offices, the street is busier than ever. The absurdity of the decision to close it must be obvious to them now? Maybe once the economy gets itself on some sort of even keel they will slowly reverse the contraction that Starbucks underwent. Sure, they grew too fast and realised in the nick of time, unlike many other companies who rode the boom of the 1990s. I just wonder if there’s a middle ground? What was good about Starbucks in the growth years hasn’t gone away. Nor, I suggest, have the customers. The competition has undoubtedly caught up so the market has narrowed, but The Essence of Starbucks is what will always win. PS: The queue is back, and has been constant while I have been typing away.